The National Biodiesel Board sharply criticized a decision by the EPA to allow streamlined Argentinian biodiesel imports to the U.S. under the RFS. The decision allows Argentinian biodiesel producers to use a survey plan for certifying feedstock. On the occasion of a high-level policy conference in Brussels organized by the biodiesel supply chain, prominent researchers have underlined the benefits of biodiesel as well as their reservations regarding the readiness of the ILUC science. A report recently filed with the USDA Foreign Agricultural Service shows that China's biodiesel production grew last year, reaching nearly 300 million gallons, up 5 percent from 2013. This year, production is expected to exceed 314 million gallons. The new BQ-9000 Retailer Program is the fourth segment of the growingly popular fuel quality assurance program, joining the previously established certifications for biodiesel producers, marketers and testing laboratories. At the National Biodiesel Conference & Expo in Fort Worth, Texas, renewable fuels supporters cheered as federal policy experts, including Byron Dorgan, Kenny Hulshof and Matt Blunt, urged advocates to write their own script for success. At the National Biodiesel Conference, Rod Woodford of Explorer Pipeline discussed tests his company conducted in a segment of its pipeline. With the right sequencing, Woodford said there's a way to confidently move B5 in the same line as jet fuel. The NBB honored industry champions and those who have significantly impacted the industry during the National Biodiesel Conference in Texas this month. Awards were given for innovation, impact, influence, inspiration and pioneering spirit. The U.S. biodiesel market shrunk in 2014 amid policy uncertainty in Washington that destabilized the industry. According to EPA data released Jan. 15, total U.S. biodiesel consumption was down nearly 50 million gallons from the record year in 2013. Arguing that federal policy makers must see through the false attacks by renewable fuels opponents and provide certainty for their advanced biofuel industry, biodiesel advocates rallied Jan. 20 at the National Biodiesel Conference in Fort Worth. Lanxess Corp. announced it has added two new highly concentrated antioxidants to its line of biodiesel stabilizers. The new products, Baynox Ultra and Baynox Cargo, were introduced to the U.S. market at the National Biodiesel Conference & Expo. Algenol and Reliance Industries have deployed India's first Algenol algae production platform. The demonstration module is located near the Reliance Jamnagar Refinery. The Algenol process is designed to convert 1 ton of CO2 into 144 gallons of fuel. Methes Energies International announced it has granted a U.S.-based entity a nonexclusive license to use Methes' design and software for a 3,000 liter per hour biodiesel processor to manufacture biodiesel processors for its own projects in the U.S.
At the new center, the companies will coordinate and co-fund research with Brazilian universities and other institutions. The research will focus on technologies that address gaps in creating a sustainable aviation biofuel industry in Brazil. The fourth annual California Biodiesel Conference is titled Understanding the Unique Benefits and Regulatory Landscape of Biodiesel - California's Advanced Biofuel. 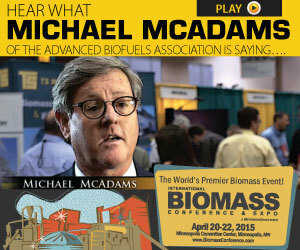 Presented by the California Biodiesel Alliance, it will be held Feb. 4 in Sacramento.